Joanne graduated from the University of the West Indies. She recently joined Boness Vets in 2016 as a member of the veterinary team. 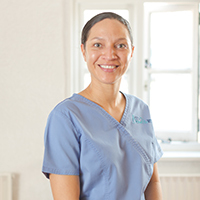 Prior to Boness she has worked in Barbados her home country in mixed practice where she developed an interest in both equine and small animal internal medicine. Since being at Boness she has become particularly interested in canine emergency medicine and diagnostic ultrasound. She is also a very passionate advocate for animal welfare. Joanne has a rescued dog named Ninja which lives in Barbados and the two of them spend most of their time laying on the beaches and surf when she is home. She and her husband Dwight both share a passion for the outdoors and anything to do with the sun, sea and sand.